The term smart city has been gaining quite a bit of attention lately. Known by many names—livable community, sustainable city, resilient city, and even smart nation or subsets like safe city or healthy community—they share similar goals. The objective is to build a government that is more responsive, productive, efficient, transparent, and more engaged with its citizens. 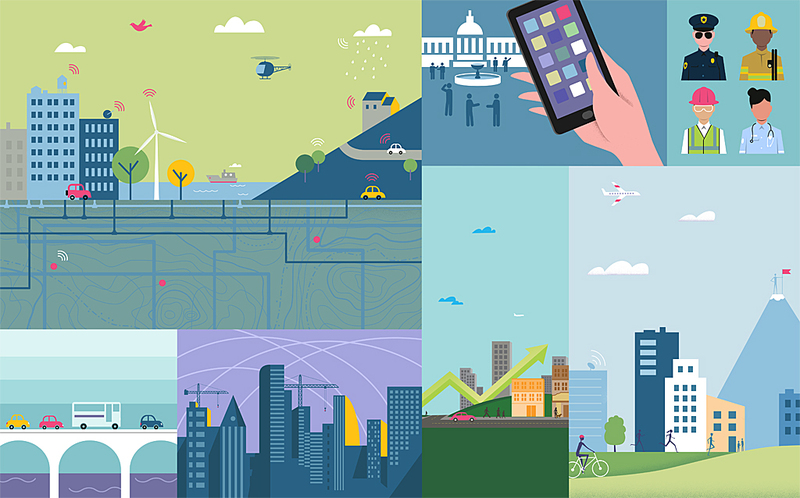 At Esri, we have opted to embrace two terms: smart communities and resilient communities. Building smart communities reflects national, state, regional, and local governments' desire to improve quality of life. Building resilient communities relates to assisting governments in preparing for and recovering from man-made and natural disasters such as hurricanes, floods, earthquakes, economic collapse, or climate change. There are a lot of smart approaches out there claiming to help build a next-generation smart community. However, most approaches only support large metropolitan areas or are focused on a single problem. After years of working in partnership with thousands of governments around the world and asking how we can really help, a clear path has emerged. This approach will support governments regardless of size or geography. It delivers solutions that cover more disciplines across a government as a means of strengthening all government operations. Think of government as a platform. At its core, building smart communities involves working side by side with governments and professional trade associations to truly understand government needs. There are four steps for creating a successful strategy to support smart communities. 1 Start with a world-class GIS platform. The primary reason governments the world over have embraced GIS is that location is the most common denominator looked at when addressing a problem. The solution needs to serve GIS professionals, knowledge workers who simply use GIS, field-workers, decision makers, and citizens. It also needs to support the five major government workflows: collecting data, analyzing and performing what-if scenarios against information, improving operational awareness,improving field operations, and enabling civic engagement. 2 Develop a location strategy that allows governments to prioritize the GIS applications they need. This needs assessment indicates a government's readiness to incorporate new solutions and how quickly it wants to make those changes. A government can begin by analyzing issues for the entire organization, department by department, or tackle a single department, such as law enforcement or health, to meet goals more limited in scope such as smart infrastructure, smart buildings, healthy communities, or safe cities. 3 Deliver real solutions that serve government priorities. Governments know that their biggest challenges are often improving infrastructure, efficiency, productivity, and local economic conditions as well delivering green solutions. They hear regularly from or poll businesses and citizens on their priorities. These governments may not always have quick answers for solving these issues. We have found that working side by side with governments and asking what apps they wish technology companies would build results in the development and delivery of apps that successfully meet real needs. These apps are honed by working directly with governments on design and testing. Once completed and tested, the solutions are given back to governments at no charge. These apps can be deployed immediately and tailored over time. 4 Develop strong relationships with business partners. Partners can deliver sophisticated solutions for permitting, crime analysis, asset management, and climate analysis, for example, that are built on top of a strong GIS platform. They can extend customized solutions that scale with a state, municipal, or regional government over time. 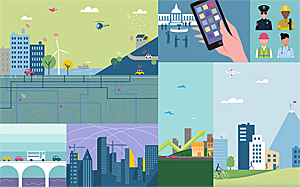 To see the results of this approach, explore these smart community offerings at esri.com/smartcommunities. Begin building a smart community today.